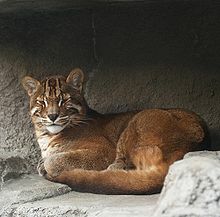 Catopuma is a genus containing two small Asian felines, the Bay cat (C. badia) and the Asian golden cat (C. temminckii). The Bay cat is sometimes classified as Pardofelis bardia, and the Marbled cat is also in that genus. Because the genetic evidence is that all three cats are closely related, they will probably all be put in Catopuma eventually. The Bay cat and the Asian golden cat are typically reddish brown in colour, with darker markings on the head. They live in forests in South East Asia. The Bay cat is only found on the island of Borneo. This page was last changed on 11 September 2014, at 16:44.